The Shop is Located at 131 Airport Road in Bismarck North Dakota. Many Sturgis South Dakota bond Bikers Visit This awesome stop along the way to one of the biggest Biker ralleys in the world. The Shop has some of the finest Mechanics in the business, greasen for the common hard working american. 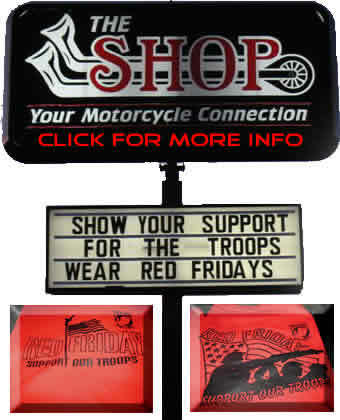 The Shop has a wide array of motorcycles, parts, accessories, clothes, motor clothes, decorations, clocks, mirrors, leather, leathers, shirts, t shirts, boots. We Would like to say thanks to for all their help. Harley Davidson, Yamaha, Honda, Triumph, british bikes, norton, american, S & S, S&S, Drag, specialties, Custom Crome, CCI, Specail Orders, John Butch Olson is the owner of this wonderfull establishment, Which has been open since 1991. Currently this Shop is going through some sparkling changes. A day at a time The Shop is going through a major face lift in rememberance of the POW MIA! Please visit our Galleries for weekly Picture. There are many Annual Events that will be posted up on these Virtual Walls for your easy viewing.